Shareowners need to be aware about their rights, roles & responsibilities and engage in a meaningful way with the promoters & management of their companies. 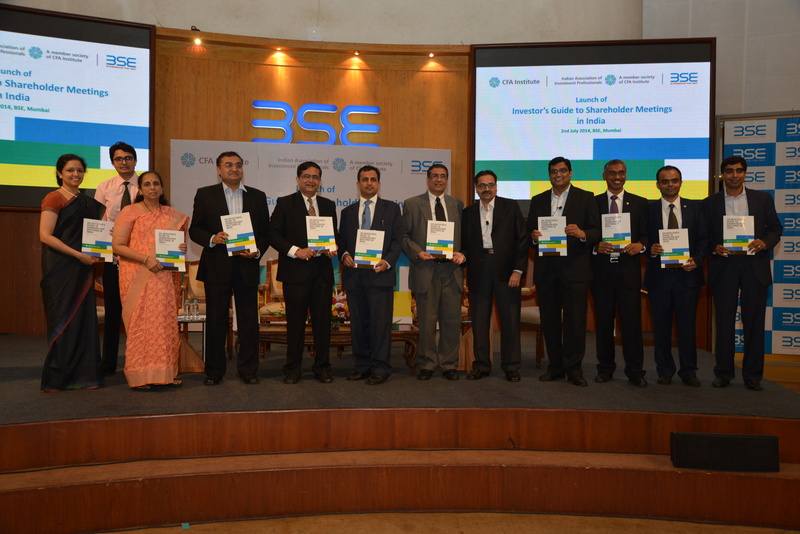 India Association of Investment Professionals (IAIP) and CFA Institute (CFAI) have created “An Investor’s Guide to Shareholder Meetings in India” with valuable research inputs provided by Institutional Investor Advisory Services (IIAS), proxy advisory service provider to institutional investors. A formal launch was organized on July 2nd 2014 at BSE International Convention Centre. After the opening addresses from Jayesh Gandhi CFA, President, IAIP and Ashish Chauhan, MD & CEO, BSE, the event had an insightful panel discussion represented by Amit Tandon, MD, IIAS; Deena Mehta, MD, Ashit C Mehta Investment Intermediates; Gopalkrishnan Iyer, SGM, Membership Compliance & Investor Services, BSE; Namit Arora CFA, Director IAIP and Director Standard Chartered Private Equity; and Navneet Munot CFA, Director IAP and CIO SBI MF. The session was moderated by Padma Venkat CFA, Director Capital Market Policy, CFA Institute, who asked questions like how much are investors empowered, whether there has been increase in institutional investor engagement and so on. The following are the excerpts of the events. The shareholders democracy came in much earlier than political democracy with the start of the first stock exchange in the world in Amsterdam in 1607 according to Ashish. Like the recent turn in sentiments towards politics in India, one needs to convert investor apathy into voter enthusiasm at the shareholders’ meetings. Investors should come out of superficial talks in the AGMs to what is substantial for the future of the company. A lot has changed over the last 20 years on the regulatory front. The new Companies Act 2013 has tried to empower independent directors and investors to question rationale for M&A, related party transactions (RPTs) etc. However, he cautioned against blackmailing of the management & promoters by few investors who are focused only on their personal gains at the expense of companies and fellow shareowners. Till very recently lack of awareness and weak power in the hands of minority shareholders resulted into limited engagement by the shareowners. However, there have been changes in the regulatory environment. SEBI has made it mandatory for institutional investors to disclose their voting policies, whether they have voted “For”, “Against” or “Abstained” from a resolution as well as the rationale. While most of the resolutions are ordinary in nature Navneet highlighted that there have been instances where institutions like his have voted against certain resolutions like increase in director compensation when the profits deteriorated, increase in borrowings limit much higher than the size of the organization, and so on. He cautioned about so many companies (900 out of 3000) organizing AGMs on the same date in order to avoid questions from shareholders. The foundation for corporate governance at a company is laid before its listing according to Namit. This include induction of independent directors, CEO compensation etc. Investors are taking issues seriously on matters related to royalty payment, ESOPs, accounting treatments, handling of forex volatility etc. The timing of this guide is most appropriate in educating investors about their rights and procedures to vote. While portfolio managers are busy making money, they should not allow corporate governance issues to be overlooked. The coming of proxy advisory firms is a welcome development. Also sell side analyst should be encouraged to come out with thematic and forensic accounting reports. To realize the dream of having retail investors base of 100mn by 2020 both investor education and corporate governance will play an important role. According to Deena small steps like introduction of transparent contract notes have resulted in exchange turnover increasing from Rs2.0billion to Rs60trillion over last 25 years benefiting intermediaries. The strategy of investors “voting with feet” is not appropriate. Shareowners need to engage with the company, discuss and deliberate with the management during AGM instead of just substituting names of chairman in the “shayari” or collecting the lunch boxes. The management should be on alert that there is someone who is watching their actions and will ask questions. Gopalkrishnan highlighted the various initiatives taken by BSE in creating Investor Awareness through its training institute as well as programs to improve financial literacy amongst the investing public. The information put on the public domain help investors in making decisions. Amit explained that in resolutions involving related party transactions the majority has suddenly become minority as related parties can’t vote on them. With the regulations in place the number of votes marked as “Abstain” has fallen from 60% in 2011 (of 11,000 resolutions roughly) to 40% in 2013 (of around 13,000 resolutions). This is encouraging. Initially investors may have voted under regulatory pressure but slowly investors will deliberate & vote on complex issues like succession planning, capital allocation decisions etc. This entry was posted in Advocacy, Events, Mumbai, Panel Discussion and tagged AGM, AGM Guide, Amit Tandon, Anil Ghelani CFA, Ashish Chauhan, BSE, BSE Ltd, CFA Institute, Chetan Shah CFA, Corporate Governance, Deena Mehta, Gopalkrishnan Iyer, IAIP, Indian Association of Investment Professionals, Investor's Guide, Investors, Invetors, Jayesh Gandhi CFA, Namit Arora CFA, Navneet Munot CFA, Padma Venkat CFA, SEBI, Shareholders, Shareholders' Rights, Shareowners. Bookmark the permalink.